Well, it’s about time. The British Geological Survey has been lagging behind its US cousin for some time now. Like the USGS, the BGS is funded by the taxpayer but unlike the American version the data has always been hard to get hold of and expensive. Bits of data have become available slowly as the BGS has gone digital. The 1:625000 scale digital geology map was released through geoindex and the OneGeology global geological mapping portal and this year I’ve been making a lot of use of their on-line rock lexicon, but up until now the 1:50000 digital geology maps have only been available via a paywall to universities or in paper form for the great unwashed. Today, the BGS released their OpenGeoscience portal, a free service for non-commercial private study, research and educational activities for viewing geological maps, downloading photographs and other information. There are six OpenGeoscience sections. 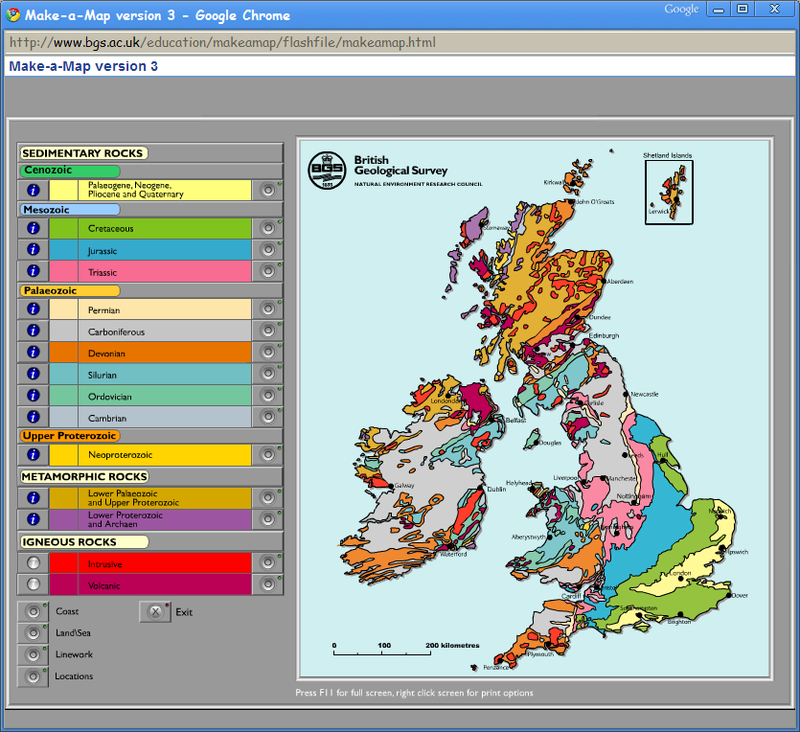 The Data section covers parts that we’ve had access to previously like the geoindex graphical front end to the BGS’s data holdings such as maps, boreholes, earthquakes and the like, the lexicon of terms used on BGS maps, their rock classification scheme and their database of mineral and rock samples. The education section also links to stuff we have had before – notably ‘Make-A-Map’ for creating basic geological maps of the British Isles. They also (somewhat bravely) provide a link to their new climate change poster which shows that climate change is nothing new and puts into context the current fluctuations with respect to those over geological time. The maps section provides three ‘views’. The first, a ‘simple’ view allows a zoomable view down to street level with the 1:50000 geological map (where available – not Northern Ireland yet) as an overlay. The geology layer, the transparency of which is variable with a slider control, is a vast improvement on what was previously available to the general public. However, the street map is several years out of date and the satellite view is quite poor resolution. Their ‘intermediate’ view is actually the 1:625000 geology kml layer for Google Earth that has been available through OneGeology for some time and which I blogged about previously here back in August last year. The ‘advanced’ data allows users to down load the 1:625000 data in in ESRI© and MapInfo© formats and also view the 1:50000 data using their Web Map Service. As an educator, however, the best part for me is GeoScenic, the browsable collection of the BGS’s photographs. I can see this being really useful for examples in lectures. Finally, and really something quite interesting, is a downloadable version of BGS·SIGMAmobile, the BGS ‘digital field data capture system’ (geological field notebook connected to a database) designed to run on a rugged tablet PC with integrated GPS units. Effectively this is a heavily customised versions of ArcMap 9.2 and MS Access 2003 and is something I’m going to be trying out in the near future. All in all, it is good to have everything together in one portal, but much is not new and still lags behind what is accessible for the US.